William Alfred Gibson (1866 - 1931). William Alfred Gibson was born in Glasgow in 1866 and educated in the city. He spent ten years in the Royal Glasgow Queen's Yeomanry and saw service in the Boer War. 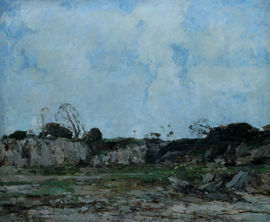 After the war he turned to painting, mostly landscapes in oil, being influenced by the Dutch school and Corot, both in subject matter and in the subdued tones of silvery greys, greens and browns which he used. 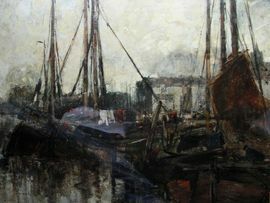 His favourite subjects were river views in Scotland and Holland characterised by powerful leaden grey skies and broken brushwork. Gibson exhibited at the RA, RSA, GI and abroad. He worked in Scotland, England, Holland and France and his work is represented in several public collections.